What a great day of darts. With the scheduling it's not really possible to get anything super in depth up despite the games taking place in the evening - it's a Saturday which means it's a football day, normal service will be resumed for the final, but for now I'll just shove all the figures through the master computer and see what gets thrown up. Given the way the matches have worked out, I don't see a great deal of value in doing anything other than the full year - van Gerwen and Cross have such huge samples on everything that I don't think there'll be a lot of variance in any given chunk of the data, whereas Lewis and Taylor's data will look the same, if only because so much of it is rear-loaded due to their limited schedules for differing reasons during the first half of the year. van Gerwen against Cross is one that we've seen many times before, van Gerwen's come through every time on the big stage, but not without a few scares, the biggest coming in the Grand Slam where he was pushed to a decider in the group stage and was only 3 legs better out of 29 in the knockout stage. Cross does have a win over van Gerwen this year, but he's been close quite a few times, so let's see what the figures say. 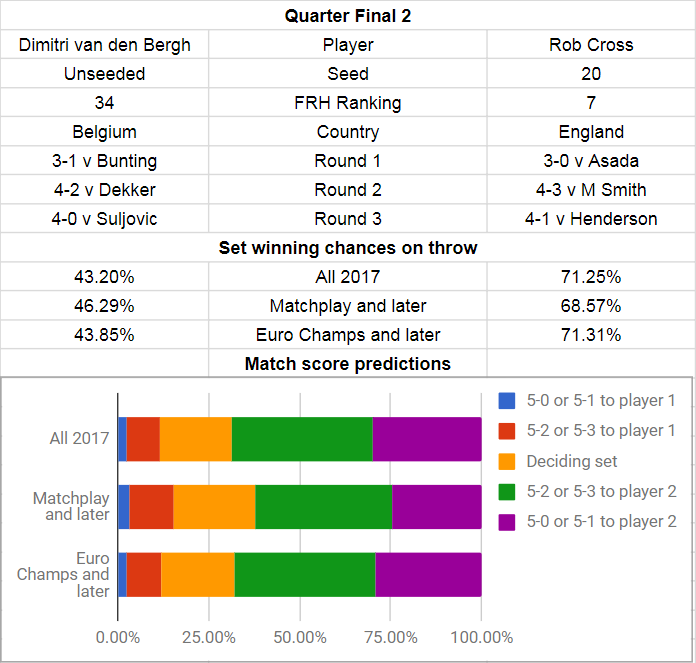 Unsurprisingly, the data favours van Gerwen - reckoning that he wins his sets on throw over 70% of the time, compared to Cross falling just short of 44%. Grouping things together the most likely result looks to be a van Gerwen 6-3 or 6-4 victory (for those who are interested, I look at sets in pairs, so that I don't need to consider superfluous variables such has who has won the darts - I don't faff with correct score betting so it's irrelevant to me), which is kind of what you would think, but it only seems a fraction more likely than a van Gerwen victory 6-1 or 6-2. It's pulling through 72% for van Gerwen to win overall compared to Cross at 11%, with the remaining 17% going to a deciding set. I'd honestly have thought this would be closer, but van Gerwen's ridiculous 25%+ rate of killing in twelve darts or less compared to Rob's 16% is probably something that the model thinks is just too hard to overcome in what is quite a long match in a race to 11 sets. The marked has it at around 80/20 van Gerwen, not too unexpected in that it's closer than the van Barneveld game (and he really should have come through that), so if I was going to bet anything it would probably be just on the Dutchman, but I think that Cross is probably playing better than his whole year figures now, whereas van Gerwen is maybe slightly below, but it's not by much and it's not by enough to swing it into betting on Cross to get through. 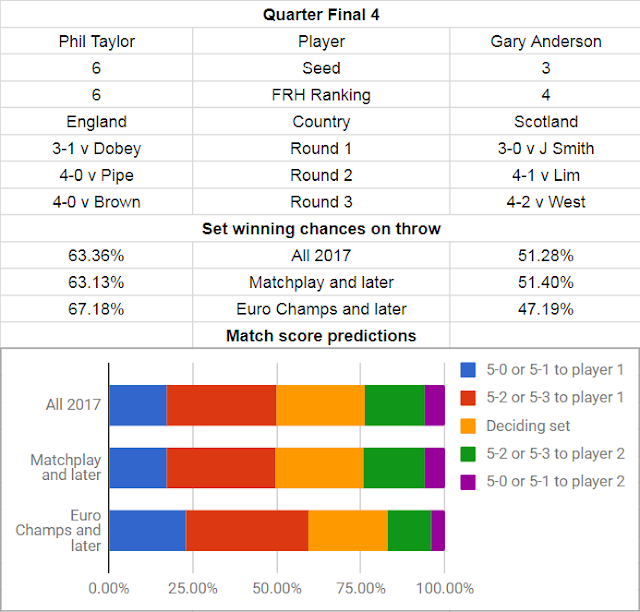 The other game is Phil Taylor up against Jamie Lewis, the Power having come through a 5-3 game against Gary Anderson that is probably a bit closer than the actual run of the game suggested, whereas Lewis swept Darren Webster with relative ease and will be much more rested up than Phil, which could be a factor. The more pertinent factors will probably be the crowd being on Phil's side, Phil's enormous banks of experience, and Phil seeming to peak at the right time in the tournament. 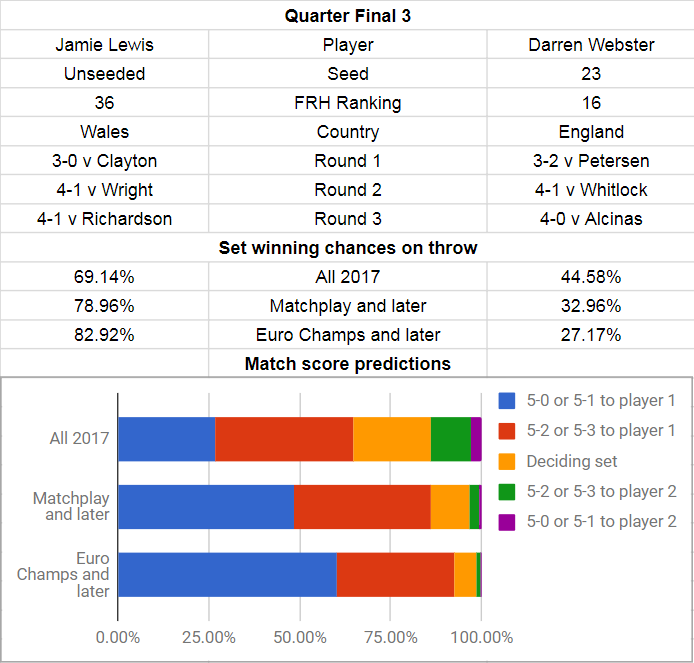 Despite Jamie's incredible performances in this tournament, the model still favours Taylor - reckoning that he holds his set on throw 63% of the time, whereas Lewis is a touch over 51% - so in theory a closer game, while the bookies have it a bit more one sided at 2/9 Taylor against 9/2 Lewis (only a percentage point or two mind you). 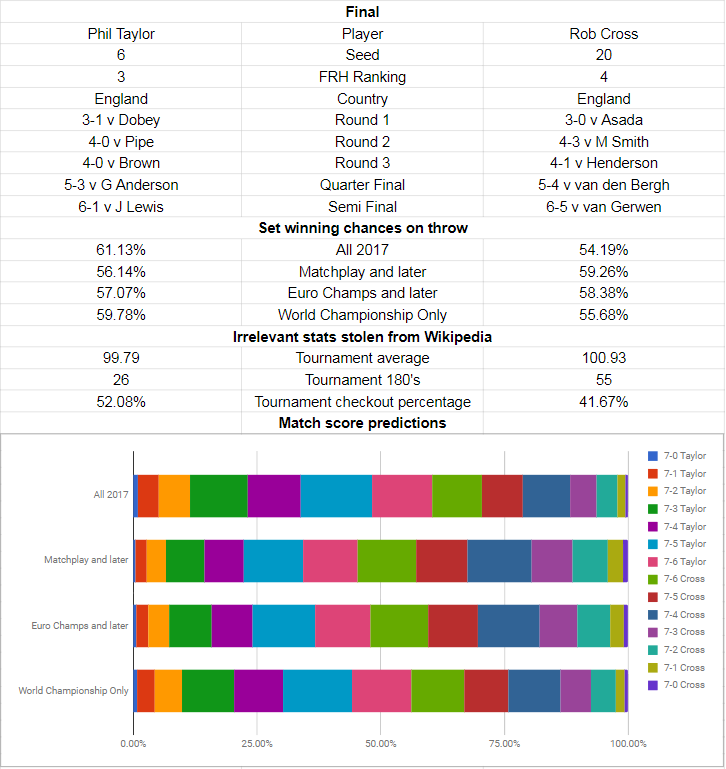 Over the course of a long match, the model reckons that the most likely outcome is a close Taylor win, 6-3 or 6-4 being the most likely outcome at nearly 30% of all trials, with Phil coming through 53% of the time overall compared to Lewis grabbing 24% of wins, with the remaining 23% being decided in an eleventh set. This should hint at a Lewis bet, but I think that a bunch of intangibles mentioned earlier could come into play enough that it moves things into where I doubt there's much of an edge, so I'll leave this one alone. It could also play into Lewis's mind that he's played Phil twice before - once in a final on the European Tour, where he lost 6-1, and then again on the floor three years later, where he lost 6-0. Jamie's a different player now, but Phil isn't. As mentioned on Twitter earlier today, this is the first match at this stage of the tournament not to feature a seeded player in eleven years, dating back to Darren Webster against Wynand Havenga in Barney's last title run, following James Richardson eliminating Alan Norris to follow up his first round win over Kim Huybrechts, and Jamie Lewis pulling off an upset that nobody apart from FRH readers saw coming with a sensational performance featuring seven twelve dart legs (nobody else has had more than four in a match so far this year, and nobody has had seven this calendar year - obviously you need a decent length match to do that but the last player to do that was van Gerwen in last year's final, where he had 13) and it could easily have been more, not getting a fourth visit after the failed nine dart attempt for example. These numbers all heavily favour Lewis, and for very simple reasons - he's been playing the darts of his life by a large distance, these darts make up the bulk of his sample size, and as I mentioned in the preview of the Wright game, his darts in the run up to the worlds weren't bad either. Richardson's games haven't been amazing - he has not hit a twelve dart leg so far this tournament (Lewis has twelve), and while his game against Huybrechts was clean enough, against Norris he could only get six from twelve legs in fifteen darts, and in the ten legs he let Norris win, he averaged 76. We've not had a bet yet in this round, but I think we have one here, because the market has this one surprisingly close - 1.5u Lewis 4/7. Even in the whole 2017 sample, Lewis gets home over three times as often as Richardson does, which is ample enough to bet on its own, factor in that Lewis is playing well and the numbers are overwhelmingly in his favour, the only question is whether we don't bet larger. Richardson hasn't played someone that's been playing well yet - he has now, and waiting to grab chances may just see him not get chances at all. Will not do the MvG/Barney preview now, will group all the quarters in one post. Price, for me, did enough tonight to make the Premier League, pity he threw away the fifth set or that could have been epic. Now for what's easily the most interesting quarter of the last sixteen that's come up so far, if only because the previous analysis features three huge odds on favourites, and the first match we'll look at is Rob Cross, who cruised through his first round game but then needed to survive match darts from Michael Smith in the second round in a high scoring instant classic featuring a staggering 29 180's, against John Henderson, who after a routine win against Marko Kantele, produced the biggest shock of the tournament so far in terms of the highest seed going out (if you think that Münch > Lewis wasn't a bigger shock then you're wrong), avenging his Grand Prix loss against Daryl Gurney with relentless ton scoring. His reward for that win is to be priced as an even bigger underdog in this round. Henderson needs to win this game 15% of the time for us to even start to consider a bet, and he's nearly there in the largest sample and would easily make up the difference in those games he wins 4-3, but the figures become more and more in favour of Cross as the year goes on, with the most recent sample where Cross is in peak form reckoning Henderson doesn't even get to 8%, leaving him needing to win a deciding set more than one time in three, which would seem a big ask. Henderson has at least got a win over Cross this year, where he won 6-4 in the first of the Ireland Pro Tour events, and kept him close the following day, only losing a deciding leg. The other game was 6-1 in favour of Cross, but that was right at the start of the year. As ever, also bear in mind that the stats don't include the Grand Prix, so while it doesn't include Henderson's best run, it also doesn't include Cross bombing out in the opening round, then again as he only won two legs there it's not going to dent the figures in the slightest. I can't recommend a bet either way. Henderson probably has the game to get there just about often enough that the line looks close enough to accurate. It's not going to be one where the Henderson, after pulling off an upset, is then spent and can't go further, he'll have had plenty of time between games and it wasn't a factor after beating Michael van Gerwen in Dublin. Then again, Cross is so good that I really don't think he messes this one up. Hmm, now for the first time in this round we've got a game where the figures look a bit different to what you might expect. Mensur's around a 65/35 favourite in the market, and looking at the whole year's worth of stats, he gets home 48/22 before a deciding set, which is nearly the same ratio, but from the Matchplay onwards, Dimitri comes in as a very tidy favourite. 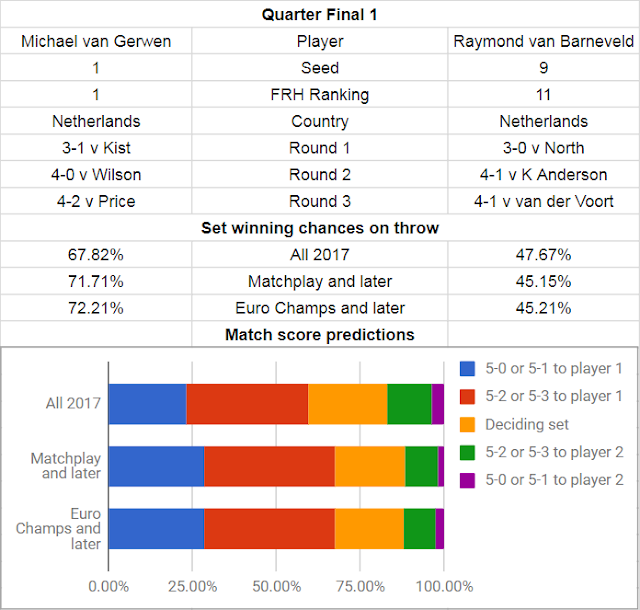 We only need to look at the preview for the previous round's game against Jan Dekker - Dimitri has not played a lot of darts at all since the Matchplay, and the primary chunk of data then was his first round match, where he was godmoding. That Dekker match wasn't quite the same story, but was still solid - nearly a 95 average, 50%+ on doubles, six maximums, half his legs won in fifteen darts. That summarises Dimitri's run, Mensur's has been mediocre by his own standards, not breaking 95 in either game on standard average metrics, needing a huge out to avoid a final set against Thornton who'd just missed bull to force the issue, only just getting over 50% in legs won in fifteen darts or less (12 from 23), and he's only managed the one twelve dart leg - the final leg against Thornton where he needed it the most. The market has already adjusted quite a bit as mentioned, so the take people have to make is whether van den Bergh, if he had more sample than the 150 legs (split evenly between wins and losses) isn't enough to give a true idea of form over a long period and that he wouldn't be able to sustain his stats and Mensur should thus be the favourite, or whether the more recent information is more pertinent, and that Dimitri's form (and Mensur's lack of it) is the critical bit of data that you're looking for and he's a very live underdog. The obvious thing is that Mensur will need to improve - if he plays as he has been doing, Dimitri's current game, even the not quite so excellent one he showed against Dekker, should be enough to win. I think Mensur will improve, but I think to about the point where he makes it such that it's not a bet. My stats don't include the world youth, which Dimitri won, or the World Series finals where Dimitri made the quarters. Mensur's been here in big TV events a lot more than Dimitri has, and while he's full of confidence, this is already the deepest he's run in any major event and the potential enormity of what he might do could easily catch up with him. Six of the last sixteen written up, and still no bets. Seems odd, but that's where we are. Expect the Whitlock/Wright section to appear tomorrow evening/Thursday morning, I'll likely push to get the Whitlock game up first as all the information should be ready when I'm back from work and it's the first game on on Thursday, the Wright game may wait until the morning. Wanted this up yesterday but dartsdatabase was down all evening and I couldn't get the head to head stats, oh well, it's here now! The first of two games which are so one sided that Taylor's a 1/12 shot and is the longer price sees the reigning Matchplay champion look to get a seventeenth and final world title, against surprise package Keegan Brown, who's doing a good job of rebuilding a career that peaked 2-3 years ago but has gone off the boil since. Taylor has had little trouble so far, only dropping the one set against Chris Dobey when he was already cruising in the match, and not dropping a set against Justin Pipe who played OK in patches but missed far too many doubles. Brown produced a great performance to see off James Wade in the opening round, but regressed quite a lot and was tangled up in a scrappy affair against Zoran Lerchbacher in the second round, each set going with throw until, at 3-2 in sets in a deciding leg, the Austrian missed one dart at tops for the set and let Keegan in to pin a 108 outshot for the match. If Keegan is going to stand any chance, he's going to have to play with freedom and the quality that he showed in the first game - if he plays like he did against Lerchbacher, then this match may not go on very long at all. That said, if he does play as he did against Wade, then his chances are not completely zero - in that game he managed eight out of twelve legs won in fifteen darts or less (including one twelve darter), and was there or there abouts when Wade was winning with a 91 average in the losing legs. Phil so far this tournament has managed 16/23 legs in fifteen darts or less for about that same two in three ratio as Keegan managed against Wade, and only had the two twelve darters, and also averaged 90 in the legs that he lost, so overall their stats seem close to identical if you compare Phil's current tournament and Keegan's best game. This said, Phil hasn't been firing on all cylinders and may opt to try to crank it up a bit to warm up before a potential quarter final with Gary Anderson, Keegan may potentially be overawed with playing Phil (as Pipe appeared to be, at least in interviews) in what is the biggest match of his career to date, and will not have the crowd on his side - there's a lot of things that need to go perfectly for Brown to realise his best case scenario - which only puts him at a coinflip. Our second game sees twice world champion Gary Anderson looking to reclaim his title, facing winner of now two games on a world stage, Steve West. Anderson's looked very smooth so far defeating a pair of dangerous preliminary qualifiers, obliterating Jeff Smith in a second set for the ages, and putting two sets on the board without reply and holding off a nine dart attempt against Paul Lim before coming through 4-1. West has had a couple of young tricky Dutchmen to come through and they've been a bit different to each other - the opening game against Benito van de Pas saw him average over 95 as he slotted in seven out of eleven won legs in fifteen darts or less, whereas in his second round game against Wattimena, he won 4-1 but averaged under 88 despite hitting 50% of doubles - only hitting five legs out of twelve in fifteen darts or less. I'm thinking that Anderson's playing far too well for West to stand any sort of chance in a first to four sets match. We've seen glimpses of what Anderson can do, and while we've also seen what West can do, both here and in spots throughout the year, I get the feeling that West may just be content to have reached this stage, and that if West's top game shows up, Anderson can just kick into another gear if needed. The stats are fairly consistent throughout the year (the only difference for Anderson between the first two samples being one UK Open match helps for that, with West not qualifying for that at all), and they all indicate that Anderson should be a prohibitive favourite. Maybe not quite as much of a favourite as the line suggests, but we don't have a whole lot of edge to start punting West at 12/1, especially when the non-stat part of the head can't really see a realistic path to victory for him. Coming up later are previews of the Suljovic and Cross matches - stay tuned. Wrapping done, TV crap as usual, still a bit of time before heading to the pub, so let's start on the round of 16 writeups! In what is only one of two possible last sixteen matches where the expected seeds have reached it this far (Wright/Norris the other possibility), defending champion Michael van Gerwen faces off against UK Open finalist Gerwyn Price. It's an important game for both - van Gerwen obviously wants to continue his amazing winning streak and claim a third world title, which was most recently extended by winning twelve straight legs against James Wilson, whereas Price is looking to cause a massive upset, or at least put up a good performance which would improve his chances of making the Premier League. Neither player has been in much trouble so far, Kist putting up more of a fight than most expected in round one against van Gerwen, whereas Price has come through two games against Ted Evetts and Ian White for the loss of just the one set, looking pretty solid in putting up an impressive 16/23 legs won in fifteen darts or less, while averaging 92 in the 12 legs he has lost. van Gerwen lost the four legs against Kist and also averaged 92 in those legs, and managed 19/23 legs won in fifteen darts or less, critically six of those being in twelve darts or less - Price only managing two. The figures all indicate a win for Michael van Gerwen, which is to be expected, and they don't fluctuate a great deal, but surprisingly things do seem to get better for Price as we have got smaller and smaller samples from a more recent set of events - surprising as van Gerwen's won everything recently, whereas Price's best run came right at the start of the season. I can't possibly think that it's van Gerwen getting worse, it is more likely that Price is throwing better darts - that said, in that UK Open run he did beat Justin Pipe, Dave Pallett, Paul Hogan, Ian White and Alan Norris, so it's not necessarily the A-list that will shut down your opportunities at winning a leg in the sixth visit, and may make Price's won leg speed profile look a bit worse than it might otherwise be. This is a huge price on Price - 16/1 almost looks tempting, but van Gerwen's looked so solid that I can't think that Price is able to keep a level of solidity for long enough while also be able to handle the frequency of van Gerwen's twelve darters in order to get the four sets he needs. Plus that head to head record - good god, if Price at least knew he'd won in the past then maybe I could see the unthinkable. I could easily see Price getting a set - the figures posted seem fairly quiet on the chances of a 4-0 win and taking odds against van Gerwen doing so seems incredibly dangerous, but I can't recommend anything on the outright scoreline. Our other match which completes the previews of Wednesday's plays is an all-Dutch encounter between five time world champion Raymond van Barneveld, and the player who he beat 5-0 in the quarter finals of the fourth of those titles, Vincent van der Voort. Much like the previous game, both have looked really good so far - Barney averaging 102 in both of his games so far, only dropping the one set against Kyle Anderson, and he's hit three twelve darters and has 17/21 legs won in fifteen darts or less. van der Voort caused a big upset in the opening round, knocking out the number eight seed Dave Chisnall in straight sets, and followed it up with another straight sets win over Pro Tour winner from earlier this year, Steve Beaton, breaking the three figure mark in that game and hitting 98 against Chisnall. In the two games, like Barney, he won 21 legs, getting 15 of those legs in fifteen darts or less, slightly less than Raymond but getting an extra twelve darter in the process. The back looking to be in good form in comparison to last year, it's perhaps a surprise given the amount of darts played nowadays that neither has met for over three years, their last encounter being a group game in the 2014 Grand Slam, but there you go. They've met on big stages previously, on top of that World Championship match, Barney's also won a UK Open final, twice defeated him at the Zuiderduin Masters in their BDO days, in that Grand Slam year he also won in the European Championship and the Matchplay, with Vincent's only wins coming in Pro Tour level events in 2009 and 2011 - although at least that latter one was a final. Barney's only 2/5 here, the market respecting that van der Voort has already knocked out a higher seeded player and his general high level of play. Barney's is better, as it has been throughout the year, but is it that much better that we can consider a Barney bet, or is it not that much better that we look at Vincent, twice a quarter finalist here, to keep the run going? The scoreline projections put Barney to win at a 68:10 ratio in the whole data set, which is good for him in comparison to the line, the Matchplay onwards being 65:11, so about the same, but more recently it's only 46:23, so just about 2:1 and more in comparison with where the line is at present. I think the key thing here is the more recent data - Vincent's had back troubles for a while now, and they seem to have cleared up more recently and are allowing him to play his better game at the business end of the season. As such I'm not going to recommend any bets in this one either - Barney should win, but Vincent is playing well enough right now that an upset is not out of the question. That's one pair of games down, I think next up I'll look at the Taylor and Anderson part of the draw as that seems to be easier to do on paper, before getting my teeth into the interesting ties that are Suljovic and van den Bergh, then Henderson against Cross. Nothing's coming out this evening, so a Merry Christmas to all readers. Our first game features the surprise winner of the Lewis last longer bet, as Jamie overcame potentially dangerous Belgian youngster Kenny Neyens in a preliminary game before flat out destroying Jonny Clayton in a straight sets win which saw him slot in four twelve dart legs, against Peter Wright, who got past the surprisingly decent Brazilian qualifier Diogo Portela in four sets, nothing spectacular like Lewis but eight out of eleven won legs in fifteen darts or legs is a handy marker, somewhat better than his year long figures. Those stats should immediately start ringing alarm bells, particularly the last two, as they project Lewis to be a favourite in a rematch from this year where Wright won 4-0 with Lewis only scraping a single leg won. Let's look at how this might have happened - obviously Wright was playing much of his best stuff earlier in the season where he won the UK Open and three European Tour events, that's a given, and Lewis's stats early in the season were limited to just a handful of European Tour events. But let's look from September on at what Lewis has done - he played Maastricht and won seven legs, one being a twelve and three more being fifteens. The next week in Mannheim he won eleven legs, nine in fifteen darts, one of those being a twelve. We then have the prelim against Neyens where he had a 50/50 split in quicker/slower than fifteen darts before the blitzing of Clayton as we mentioned. What about when he's losing? A casual 93.5 average, which is within a point of what Wright's done on that stat all year. It's not a huge sample, but I kind of think the stats aren't lying that much, and the eyetest from the first round certainly backs things up. There's an issue that this isn't the greatest sample, but if we factor in that Wright, while he's come through a first round game and didn't show any health issues that worried a few pre-tournament, may not still be 100%, isn't exactly in the hottest of form (let's not forget that his last game before the worlds was a loss to Steve Hine of all people), this is somewhat of a revenge game, and that we're also getting a great price, this seems obvious - 0.1u Lewis 6/1. This only needs to work 15% of the time to be profitable, and it's using the same theory as the Henderson/Gurney game - it needs a lot of stuff to go right, and it doesn't go right that often, but it doesn't need to. Our second game features Alan Norris, who overcame Kim Viljanen in a straight sets win that was probably a bit closer than the scoreline suggested with Viljanen at least threatening in places, against James Richardson, who after a break of a few years stunned the general darting viewership (but not FRH readers) by knocking out Kim Huybrechts in straight sets. Both won just the nine legs obviously, Richardson with seven of his nine in fifteen darts, while Norris managed just the five, although one was a great twelve darter to help claw back the second set. The figures look pretty consistent throughout the year, and they all favour Richardson by a small amount, while the line has Norris as a favourite, but not by much, in the 60/40 bracket. I've been stung by betting against Norris a few times, particularly on TV where he seems to do somewhat better than on the European Tour. Let's sanity test these figures - Norris is certainly a bit more consistent, although neither can really call themselves that. Over the whole season Norris averaged just less than a point lower than Richardson on winning legs, but was about the same amount higher on losing legs, so his range is a bit tighter. The full year certainly has a much bigger sample for Norris, closing in on 400 legs played (albeit with a slight losing record), while Richardson is down just over 160 legs played, but went into the black following the Huybrechts match. 160 legs is enough that it's somewhat significant, and it's come from throughout the season - regular European Tour play, a couple of his UK Open games were captured, the European finals as well as the previous round here. This should be a Richardson bet, but both of them are pretty swingy so there's a lot of variance involved. I'm inclined not to bet as I think Norris has more gears that he can move into if needed, which he often does in the big games. Then again, I remember the European Championship where both players had a common opponent in Simon Whitlock - Richardson lost 6-3, but Norris lost 10-0. There's also probably more pressure on Norris - he's defending a quarter final, and given how wide open things are, if he gets through this and can push Wright (if it is Wright) hard, or even win, then he could get a Premier League invite. I won't bet and probably regret it. Our second second round rematch of this post features Simon Whitlock, who'll hope to take advantage of the draw opening up to get a run to the quarter finals, if he can avoid a repeat of the 4-0 reverse against Darren Webster. This game is somewhat similar to the previous one, where Whitlock is installed as around a 60/40 favourite, but the figures favour Webster, by around the same amount in the largest sample, but gradually getting larger and larger until you get to the European Championship onwards, whereby Webster is reckoned to destroy the Australian like he did last year. How is this working? Let's look at what they've done in that time period - Whitlock had three games in the Euros where he got around half his legs in fifteen darts. He then had a nightmare of a Grand Slam, but didn't actually record that many winning legs to affect things, his performances at the Players Championship weren't great either, a similar 50/50 split of legs in his opening game, but again, in a reverse to Jan Dekker he only got one of his five legs in fifteen darts. In his first round against Martin Schindler, he won eleven legs, and he could only finish two of those within fifteen darts. That's not good. Is it a case of his opponent's pushing him really well and causing him to miss out on premium leg winning chances? Not really, in the Euros he had James Richardson and Alan Norris, then MvG to be fair, but at the Grand Slam he had a guy with dartitis and a BDO opponent, at the Players Championship he had Christian Kist and Jan Dekker, then he had Martin Schindler in the previous round. So only one real truly elite player, and in his losing legs there he managed 91 - bang on his season long average. Webster came through a surprisingly resistant Devon Petersen, and the worry is that Petersen won his legs the same way that he's done all year - by his opponent letting him. Petersen won eight legs in the match but only one was a fifteen darter. Webster did well enough to get eleven legs, seven in fifteen darts, but only averaged 84 on the legs Petersen won, which is kind of bang on an 18 dart leg performance. He needs to tighten that up quite a bit, but I think he should be able to do that - at all the other majors in the run up to Christmas he's been clocking off in fifteen darts in good order. Webster's got to take a bunch of confidence in coming through a bit of a grind of a game, and should be able to open up against an opponent who he knows he can turn over - 0.5u Webster 11/8. And finally to the one that's the most awkward to analyse from a statistical standpoint, as Münch only has this event in the database, and Alcinas for the whole year only has 23 won legs, 11 of which are from this event. Neither Alcinas nor Münch played a game between the Matchplay and the Euros so those figures are the same, so I'll just ignore the last one. There's not much to go on here apart from the worlds so let's look at that. Clearly Münch's performance was a lot more impressive - Adrian Lewis, a two time world champion, is clearly a more difficult opponent than a somewhat out of form Cristo Reyes, and they both came through by the same scoreline. Moreover, the manner of victory was much more impressive. Münch managed seven of his ten won legs in fifteen darts, including two twelve dart legs, tacking that on to getting three from six won legs in his prelim where Oreshkin didn't test him at all. Alcinas on the other hand got eleven legs against Reyes, but only three were in fifteen darts, and in the legs Reyes won Alcinas averaged under 80 - and neither of these can really be put down to bad doubling, 40% from Alcinas is perfectly respectable. I'm really not sure why the bookies have this even - sure we know that Alcinas was a very competent player five years ago, but that's five years ago now, and sure we know his floor form has been good, but we don't know how good and whether he can actually bring it to the stage. Münch has at least shown a good game here and came through a better qualifier, while it's possible he's a fish on a heater, I'm thinking probably not but will exercise caution in bet sizing - 0.5u Münch evs. Will aim to get a couple of third round games up each of the next two days, but that may be done quicker or slower, they'll be up before kickoff regardless, particularly the Barney and van Gerwen games which are the first two up. Firstly, what a shame Paul Lim couldn't pin that nine dart event, that would be the greatest story of all time. Oh well. van Gerwen looked truly unstoppable in not losing a leg and only allowing Wilson four darts at double, three of which were at bull and one at double sixteen, ironically after hitting two bulls trying for 132 in a route that I'm still not convinced by. Suljovic didn't have it all his own way against Thornton, doubling being OK but scoring still off kilter, he's still not managed to kick a leg off with three perfect darts and only hit the single 180 yesterday. Was a tale of 121's - Thornton missed his for 3-3 in sets, Suljovic hit his for the match. Who knows what happens if Thornton pins the bull? Suljovic definitely needs to improve or Dimitri beats him next round. An intriguing matchup to close the evening session. Both players came through domestic Pro Tour debutants with relative ease, Anderson having a little bit more trouble with Jacques able to get a set, while North continued to struggle to translate his form game to the stage - scoring was OK but doubling was a bit of an issue for him. This has become a big opportunity for either as, despite his decent form in running off seven straight sets, you'd have to fancy either against Vincent van der Voort, it's probably more critical for Kyle as he's one of many that are on the borderline of in/out of the Premier League, a win over Barney and then a run to the quarters where, against a probable opponent of Michael van Gerwen, anything can happen as we saw at the European Championship. Those numbers are fluctuating wildly. The first and the last data set indicate this is a very strong van Barneveld bet with the veteran Dutchman installed around a 70/30 favourite, whereas the middle sample, while still favouring Barney, isn't doing so by much and thinks that Anderson can pull the upset enough to be worth betting on the underdog. Let's drill down into the samples a bit more - Barney's early figures (compared to later ones) come from the UK Open primarily where he was blisteringly hot, checking out in twelve darts nearly 25% of the time and fifteen darts over 75% of the time. There's a rare European Tour outing in there where he was playing OK, but that's not a huge chunk of the sample. By comparison, Anderson only has some middling European Tour runs in there. In the section that looks best for Anderson, he's including some much better European Tour runs in terms of the numbers he's put up, whereas Barney just had a mediocre Matchplay. In the most up to date stats, Kyle had most of his numbers from the European Championship, where despite making a semi final his numbers were nothing special, nor were they in round 1 where more of his legs were won in more than five visits than otherwise, whereas van Barneveld had a solid 7/9 legs in fifteen darts or less against North and similar very good numbers at the Grand Slam. It's hard to say which of these are the truest reflection, the best Anderson one came from the section where we're still counting the form he was in during the summer where he got his Pro Tour win and his unranked TV title, which gives us a simple conclusion I guess - if Anderson can bring his best game, he can win this often enough, if not, van Barneveld's solidity makes this too hard a task, if Anderson has the sorts of games where he's missing doubles, having a couple of visits where he doesn't hit a big treble in a leg, then Raymond will not let him off. There's enough uncertainty here for it to be a no bet. Gurney is a 6/1 on favourite here. I've said this before that, for reasons I've not been able to work out yet, my stats seem to underrate Gurney by quite some distance. Even accounting for that though, we still need to find a way to knock Henderson's winning chances, which even in the worst sample that's the most recent, give him a 1 in 4 shot before we consider what might happen in a deciding set, down to the lower teens where it becomes incorrect to punt on the underdog. Firstly, that the stats do not include the Grand Prix negates both of them, as that was both of their best tournaments. Next, let's talk sample size - I've got over 100 won legs from Henderson in the largest sample, while it's not as big as the 300+ I have on Gurney, it's a significant enough size that we can run with it (although Henderson's in the last sample does get a bit small due to early exits/not qualifying for the main tournaments in the sample). How about consistency? Gurney's losing average is a lot tighter to his winning average than Henderson's is. Could it be the case that Gurney is such a tidy player that, in the event that he doesn't kill in five visits (which he does nearly 60% of the time when he wins a leg), he does so in six visits quite a bit as he's left himself a lot of easy outs? As an all round solid finisher, that's a possibility I guess, he's played a lot of the European Tour and will have had lots of chances to take legs a bit easier against a generally weaker opponent, then again at the same time Gurney has gone real deep in all relevant majors so will need to have played against top players in longer matches. That's the lot until after the Christmas break. I'll round up the remaining round 2 games probably tomorrow and also get started on the round 3 games that we know - right now it's only van Gerwen against Price and Suljovic against van den Bergh, but by tonight we'll also know who plays Vincent van der Voort and Gary Anderson, who'll play in what'll likely be the Phil Taylor game, and then the Gurney/Henderson/Smith/Cross section as well. Firstly, DIMITRI extending the FRH betting expert analysis sunrunning and putting us further up for this tournament, and it also notably puts him up above Ronny Huybrechts in the FRH rankings, which should hopefully stand him in good stead for making a World Cup debut. Gerwyn Price and Vincent van der Voort were two games that I thought would go the way they did, but nowhere near the size of victories in either case, Price is probably done barring miracles but I'd think he's done enough at this stage to make the Premier League with every other marginal player cocking the worlds up epically to date. Vincent is lining up against the Barney/Anderson winner, and the way he's playing, who's to say he can't cause an upset? Here comes what should be one of the most anticipated matches of the second round - two 27 year olds clashing with a potential last sixteen game against Daryl Gurney (or John Henderson) to come. Their first round games were somewhat contrasting - Cross having what looked like a fairly routine win over Japanese qualifier Seigo Asada, but while hitting three twelve darters was still forced to deciding legs in two sets, whereas Smith needed a deciding set to get past dangerous debutant Steve Lennon, clocking off seven out of eleven won legs in a "par" of fifteen darts. Cross has clocked up an amazing amount of matches in recent times, 130 legs won in the smallest sample listed compared to Smith's 54, so those figures where Cross looks the best can in no way be put down to dubious statistics. He is that good, and his consistency on the pre-worlds stats was much tighter than Smith's, with around a two and a half point difference between winning and losing, in comparison to Smith's five. My first thought would be that Smith does enough that, if he brings his best game, he can take out Cross often enough for it to be a bet on Smith. As it's nearly a 75/25 game according to the market, it's not asking much, particularly when you factor in intangibles - Smith's pulled out wins on this stage in big pressure situations, whereas Cross is still on debut and it's still the first time that he's in a situation with a huge crowd where he is expected to win against a player who, if he turns up, absolutely can defeat him. Over the course of the full season data, this is a slam dunk Smith bet, but over more recent samples, Cross looks to be the place to put your money, although not anywhere near as clear cut as in the whole year sample. You've got to bear in mind that the full year includes Smith's only win this season, and is from when Cross was only really warming up. I'm thinking that I avoid this and just enjoy the fireworks. Now for one of the less interesting second round matches that we haven't already analysed, as Taylor flies in as a 1/10 favourite against Justin Pipe, who avoided match darts against Bernie Smith and advanced in overtime in a deciding set. I don't think too many pundits saw that one coming. Taylor didn't look his mercurial best against Chris Dobey, but did enough to get the win and capitalise on what he was given. This should be a formality with Pipe only just coming through a game featuring a coughing "incident", but Taylor's 10/1 on, and it needs an awful lot of certainty to consider betting on him. Pipe's up at around 6-9% to win the game depending on what sample you look at (Pipe doesn't have the greatest, and Taylor's isn't large either, to the point where his sample for the first two time periods is the same. With Taylor looking not his usual überconfident self in the opening round and Pipe throwing a level of throwing speed that isn't that far off in the first game, there's just about enough weirdness factor that I don't think we can just bet Taylor and print. Evenings have been a bit hectic the last two days so I've had little time to look at the Barneveld/Anderson game, which threatens to be a stormer, or the Gurney/Henderson game which is a nice redo from the Grand Prix semi final, those games don't take place until the Saturday evening, and I've got everything apart from the newly decided Smith/Cross and Taylor/Pipe games written up that takes place before the Saturday, so there's a bit of time on my side to get those out. Hopefully I can get off work on Friday early to watch some of the afternoon session, and I might try and knock a couple out tomorrow evening (probably Smith/Cross as that's the first game up I've not written about, and Taylor/Pipe as it's the simplest). So the last couple of days. Oreshkin seemed a bit disappointing, being the only player to date not to start any leg with a perfect dart, not that we were to know what Münch would go on and do later on at the time, whose prelim performance appeared on the numbers to be just professional. Henderson/Kantele and Barneveld/North went kind of as expected, neither showing a massive amount of resistance, although North did at least score OK, he just missed doubles, and if that comes with a bit more stage experience then he should get improved results. Lewis/Münch is clearly the shock of the tournament so far, and possibly the biggest shock since Barney/Richardson, Lewis didn't seem to be playing that badly on the numbers, he just got outplayed - the Bochum native (VfL represent!) banging in maximums for fun and giving him what was the biggest fantasy score until Michael Smith usurped him tonight. On that form, a game against either Reyes or Alcinas (the dartsdata form guide showing them both at five straight losses) doesn't seem unwinnable. Tonight, Zong's numbers were clearly better than expected. He still lost, which is good for the bank balance, but he hit a couple of maximums and in the second set was at least able to nick a leg and generate some shots at double, just not quite scoring enough to create more chances at an out. Smith/Lennon was a decent game, both getting more in fifteen darts than otherwise and both rattling in the maximums as if it was going out of fashion. Smith's last set was particularly impressive, kicking off with a maximum against the darts and following up with a four visit break, then starting with two maximums in the next leg, even in the leg he lost he'd left himself on double after twelve. He looks in form and could trouble Cross in a game that's not to be missed. Whitlock seemed poor, very poor, he won eleven legs but needed six or more visits in nine of them, and when Schindler was winning he was averaging under 80 (obviously that clownshow leg where Schindler broke in a tenth visit doesn't help). With Lewis out he clearly has a potential run to the quarters which ought to get him into the Premier League, but if he plays like that Darren Webster will do him over again. Pipe/Smith seemed a bit like a war of attrition, Pipe probably playing slightly better but not by much, and Smith really should have closed out that last set in the fourth leg. He's given you 21 darts to win the match and you only make two match darts for yourself having kicked off 60-140, that's really not good at all. Interesting numbers, I thought that Suljovic would be a more dominant favourite than that (the market has it at nearly 75/25 in favour of Mensur), and that the stats would be trending further that way the nearer we got to the present, not shifting in favour of the Scot so much that there's not much to split them at all. But let's add some caveats - Thornton's data for the whole year is only from 38 legs plus those that he won against Brendan Dolan in the first round, that's not much of a sample at all - Suljovic has a sample five times that size, and it is likely to be more reliable. Thornton's finishing against Dolan was very good, with eight of nine legs won within fifteen darts including two twelve dart legs, and with him not playing either the Grand Slam or the European Championship, the only other data in the last sample is from the Players Championship, where he didn't win many legs at all. Suljovic's overall data doesn't include the major he won as it was unranked, while Thornton's best run was in the double in Grand Prix, so that's not in the data either. If you take the full data set, Suljovic wins within the distance at about a 51:20 ratio - that's not a million miles off the market price. If you want to look at whether Thornton would keep things as tidy over a larger sample, season long his losing average was less than two points off his winning average, so it's probable that he does, and that he's maybe been unlucky in places to run into decent opponents. I didn't watch the Thornton game, but Suljovic didn't look in complete red hot form against Painter, who was quite bad, while Thornton at least averaged 98 in his game. Seems mad to suggest it, but if it's a bet either way, it's a bet on Thornton at the underdog price of nearly 3/1, but I'm not in a habit of backing Thornton (the last time I did it was in the 2016 Matchplay, where he lost 11-2 to Chisnall) and I'm not going to start now. A game where there's a big sample size issue - as an international qualifier, the only data I have on Lim is his amazing performances last night, but also for Anderson, he's not played a great deal of ranked darts either - at less than 100 legs in the 2017 to date sample (early busts in several majors, if he played them at all, no European Tour) there's not much to go on, hence the stats don't change a great deal throughout the year. Anderson took Smith apart with a 100 average despite needing seven visits to win three of his legs won - a blistering second set having a lot to do with that, while Lim came through an edgy game against former Lakeside champion Mark Webster, missing a match dart that let Webster back in but not making more mistakes after that, and slamming in maximums for fun. But let's put things in perspective - Lim won 19 legs yesterday, but only managed ten of them in fifteen darts or less, and was averaging under 90 in the legs he lost. That might cut it against a struggling, nervous Webster, but won't work against a truly elite player like Anderson. The bookies make this game the same line as the van Gerwen v Wilson matchup, and I really don't know who that's being unkind to, if anyone, I'm going to ignore it as even in Lim's best projections he doesn't get home anywhere near enough to consider a punt, and 1/25 on Anderson doesn't seem worth any sort of bet as it's so short. After all, stranger things have happened - see the World Cup for one. Some things to look for on Thursday/Friday once round one is done - I'll post an updated FRH ranking list to show who's making strides in the right direction, and I'll also post up the Peak Boo rankings which I've previewed on Twitter, highlighting who has got the biggest boo for coming closest to a nine darter but failing. As Oreshkin has just lost, despite Münch missing a trillion doubles for the game, he's become the first player not to even register a 1 on that ranking. Possibly be back later for previews of Kyle Anderson and Daryl Gurney against their respective opponents. - Lewis looked outstanding. As I've commented on Twitter, he managed five four visit kills, two more than anyone else at this stage (admittedly he did have a prelim match, but he only got the one there, if you just consider round one he still leads the field), he's managed to get the highest score in each round in fantasy which is out of nowhere. Will need to keep things going like that to stand any chance in a rematch from last year against Wright, but if Wright's health issues mean he's not fully on then it's perfectly possible. - Happy with the Viljanen bet. It needed a few things to go right, there wasn't much he could have done in the first set, but he had the shot to win the second and couldn't take it out, really disappointing to be broken twice in six visits from a 2-0 position. If he grabs that set I think Norris gets quite nervy, but we'll never know, Alan's probably going to have to up his game in the next round regardless of who he plays. - Kyle Anderson did enough to get home but didn't look quite on. Jacques didn't do too badly, was pretty impressed with his adjustment to the treble 20 on several occasions after a duff first dart, if his first dart was clicking you can see what he has and why he managed to get to that Pro Tour final, a lot of his doubles didn't miss by much. - Clayton was unbelievably disappointing. Maybe the hype train caught up with him, looking back at things he had little chance in the first set, the second could have been there but he threw away both his legs on throw, Jamie offered him no opportunities in the third set and cleaned up beautifully in the final leg. Will probably give the prelim game a miss tonight, may try and get back for the Wade match, definitely fancy the Chisnall game.